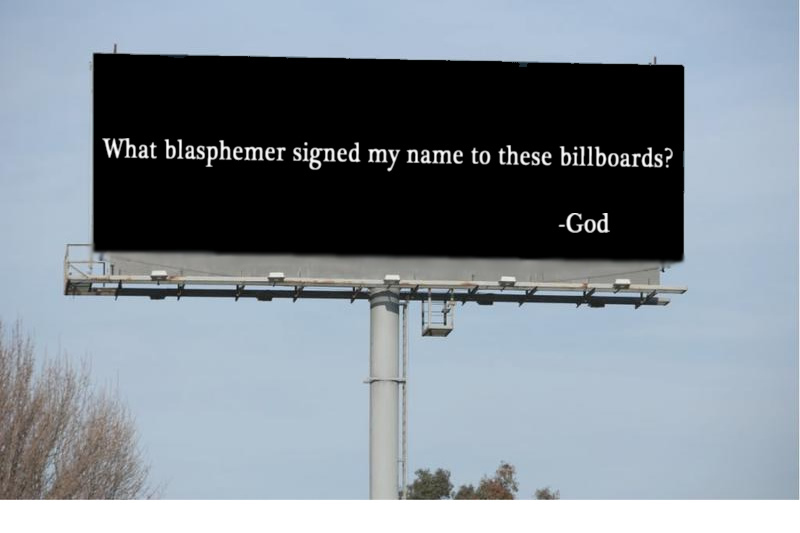 Today I drove past another of those black billboards with white typewriter letters forming cute little remarks like, “If you think it’s hot now, wait’ll you get to hell.” Or “Let’s meet at my place Sunday before the game,” signed “God.” The one I saw today said, “There’s no downside to a relationship with me.” Again, God. Not only do such billboards constitute yet more trivialization of the Christian religion by Christians; they also raise more serious questions, not to mention greater ironies. Anyone familiar with the work of Christian apologists like William Lane Craig, Richard Bauckham, and Mike Licona knows how vociferously they resist the notion that early Christians would have coined sayings, then fathered them on Jesus to give them greater authority (anybody gets trumped by the Son of God). And the apologists have the same motivation: they want to convince you that you have to believe the statements ascribed to Jesus in the Bible. The early Christians knew nobody would believe and obey something they told you on their own authority, namely no authority. So they used the Jesus character as a ventriloquist dummy. And today’s apologists are doing the same thing. “Jesus” is the megaphone for the opinions of mere mortals. There’d be no reason to believe them, so they hide behind the curtain in the special effects booth, thundering their dictates as if they came from God, AKA the Great and Powerful Oz. I find it hilariously ironic and very revealing that their own people are doing just what evangelical apologists maintain the New Testament Christians never did. 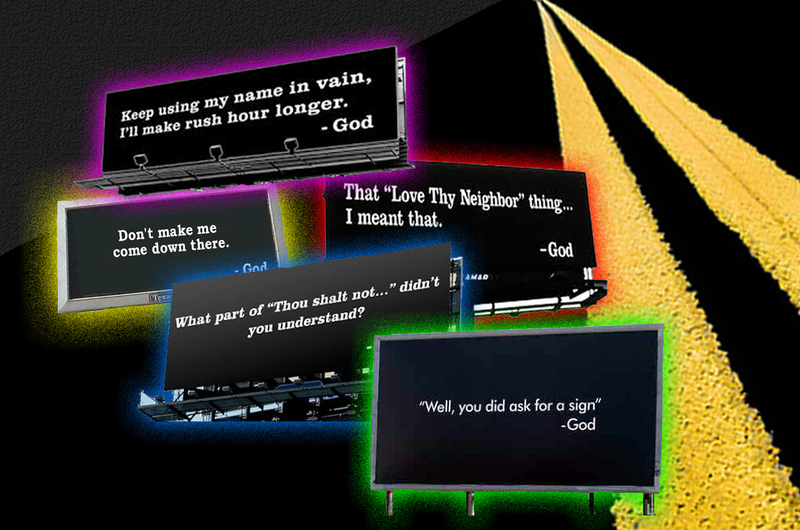 These billboards are created by evangelicals who have no qualms about making up cute sayings of their own and slapping “God” under them. “Oh, but they don’t really mean that somebody, in some prophetic trance, heard the Hestonian voice of God! They figure anyone who reads the signboards will realize it’s kind of a ‘what-if’ gag.” Really? Maybe so. But then how do we know the early Christians attributing sayings to Jesus meant it literally either? It’s propaganda pure and simple. And the appeal to “authoritative” revelation is designed to circumvent reason and logic. If “God” said it, well then, it must be right! “Even if it makes no sense to me, it must nonetheless be true. God is certainly smarter than me!” If there were one, yes, sure, he’d have to be. But what reason is there to think there is a deity who issues these commandments and doctrines? What possible reason is there to believe “his” “revelations” have not been cooked up by fellow mortals (and not necessarily very smart ones)? As Durkheim suggested, any society christens as “divine sanctions” those man-made rules and values it deems most important. The rule-making elders understand that, if people knew these rules were the invention of mere mortals like themselves, they would say to themselves, “Well, that’s just the opinion of those mossbacks! Who says they’re right and I’m wrong?” And then, they fear, you’d be asking for chaos, as the Book of Judges puts it, “every man doing what is right in his own eyes.” So, the rule-makers think, it will be safer to intimidate the mob into believing the gods have handed down these rules and will kill us or damn us if we disobey. In this event, even if the rules and values are fine and good, the system becomes corrupted by the simple fact of deceit at the foundation of it. It is the sin of priestcraft, of pious fraud. Humans appoint themselves the Grand Inquisitor. They, like the Mullahs of Iran, are sure they know better than the rest of us and do not trust us with freedom of action and free thought. The Book of Revelation, chapter 13, depicts a scene in which the False Prophet, the promoter and press secretary of the Beast, the end-time tyrant, wows the crowd by making a statue of his master seem to speak aloud. As I read it, the point is not that the False Prophet performs a genuine miracle, albeit Satanically inspired, but rather that he is conning the rubes by using a common stage illusion. Even in the ancient world tricksters and entertainers used ventriloquism and voice-throwing to make it look like a statue spoke. What the False Prophet did was cheap priestcraft. And that’s what religion has always done when its spokesmen have elevated their own best (?) thoughts to the status of divine revelation. And no one stoops to this if they are convinced of the persuasive logic of their position. I think that’s as plain as if it were plastered on a billboard. Hey, Bob. Long time no see. This kind of reminds me of how religious folks (and other folks too, I suppose) use Einstein as their ventriloquist dummy when they dishonestly want a towering intellect to make their point for them. There are so many false or dishonestly truncated quotes attributed to Einstein that even Snopes can’t keep up with all of them. BTW, I loved the “Well, you did ask for a sign” joke. Dr. Price, I know by your podcasts that you have little interest in the generic, flavorless “mega churches”, but this phenomenon does possess characteristics that are relevant to this post. I realize you dislike the aesthetics of these churches, but the psychological trend is quite interesting to follow. Basically, these churches do away with the small church model in which the pastor personally knows you, visits your sick grandma, etc. These churches are obsessed with cultivated CEO pastors, obsessed with all the latest trends on business leadership, Peter Drucker management principles, communitarianism, etc. What it boils down to is that all these megachurch pastors are using the lingo of “vision casting”. They start their church on a “vision” that God supposedly gives to them. They have a very strict notion of church discipline: not for those who commit sins such as adultery, but for those who question the vision. For to question the vision is to question God himself. This is one reason why there is so much concern about megachurches in certain sectors of conservative/fundamentalist Christianity. It’s clearly perceived that mega church leaders are adding to Holy Writ by claiming divine inspiration for their activities. They are continually saying “God told me to”, “God laid this on my heart”, “God gave this vision to me that over the next 10 years, we would reach/baptize 50,000 unchurched people, start 11 new campuses … “, etc. The rewriting/reimagining of Christianity is already taking place. And the willingness with which people in these churches just accept it makes it very easy to imagine that such has always been the case with successful religions: charismatic leaders essentially making it up as they go along and claiming God’s imprimatur. 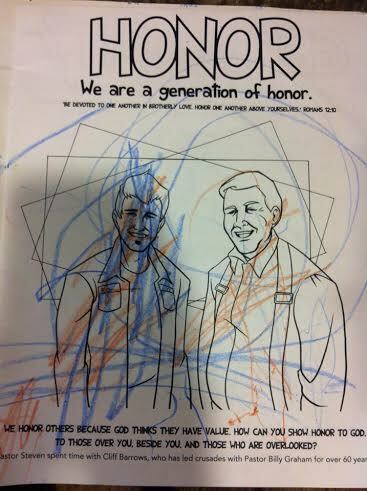 This is from a children’s coloring book distributed by Elevation Church (Steven Furtick) in North Carolina. It reminds me of those old Stalin era propaganda posters featuring beatifically happy children flocking around a benevolent Stalin.